Tuesdays With Dorie has been such a major part of my life that I’m incredibly sad to say goodbye. Granted, a new group will soon begin in just two months time, with another of Dorie’s books, Baking with Julia, but I feel it just won’t be the same. The many friendships I’ve cultivated and the new challenges that have come my way have made the last four years something truly special. Our final recipe is an easy one. Peanut Butter cookies rolled in chopped peanuts, then filled with a rich jam or (for the chocoholic, like me) chocolate chips. Baked in minutes, devoured in seconds, they’re some of Dorie’s finest ‘cookie jar’ cookies. It’s with pride (and a bit of sadness) that I give you Dorie’s Kids’ Thumbprints, chosen by Ms. Dorie herself. 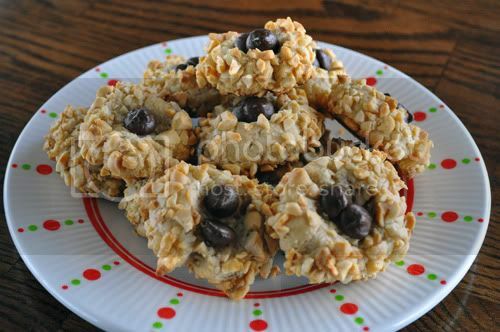 You can find today’s recipe and a wonderful, teary-eyed post by clicking over to Dorie’s site. To Laurie, Julie and especially, Dorie: From the bottom of my heart, thank you for four sweet years!! Your cookies look amazing! Yum! Thank you Julie for a sweet post. TWD is a great group. I’m happy to have been a small part. I agree with you! TWD had such a great dynamic and is one of a kind… not sure if any other group will ever feel the same way. Can’t believe it is over!!! You will be joining us nonetheless for the new venture, exactly the same or not, you have no choice or we will come and hunt you down and point out all the benefits to keeping up with all of us…right? Right. Your cookies look really good. And, come on, you chocolate lover, you want to make that chocolatey ruffled thing in the BwJ book, you know you do! 😉 See you in February! Such a sweet and bittersweet ending to this wonderful group! Thanks for always stopping by my blog! Thank you so much for being a faithful member of our special group. I am so very thankful for all of you that made it such a warm and encouraging adventure. I so hope you will join us for the next journey as well. Much love. Sad to end but sweet cookies to keep us happy! “Baked in minutes, devoured in seconds” – Well said! It seems like we worked our way through the book just as quickly. It’s hard to believe that after all this time, the last recipe is still a winner! PS – saw your news on Facebook, huge congrats! TWD has been so much fun! I’m excited for the next group, but you’re right – it won’t be the same. This group has some magic and we were all lucky to be part of it! It has been fun hasn’t it. I am also doing Baking with Julia so i am sure we will meet often. Your cookies look perfectly delicious. Beautiful cookies. I’m really surprised that we don’t all weigh 500 pounds after 4 years of goodie-making! Looking forward to the new book. Great thumbprints and a great post. Hope you bake on next year. Ciao ! Wonderful cookies ! I hope to bake again with you soon ! Baci and Happy New Year ! What lovely cookies and a lovely post. It is sad that this book is ending. We’ll have to stay in touch. Thank you for all your sweet comments through the years and your encouragement. Happy new year! 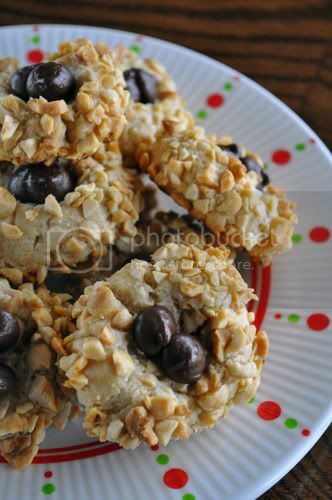 Your cookies are so beautiful with their chocolate chips! I’ve loved TWD and am so grateful for everyone that baked along, thank you! Those cookies look amazing! I can’t believe that group is ending. I used to belong but got too busy at the time. I didn’t even know Dorie had another cookbook. How exciting! I know, I worry it won’t be the same after TWD. Your cookies are picture perfect… yum! I’m so glad this was an easy recipe – but it was HARD to make… very emotional. They look fabulous – I love the chocolate peanut butter combo. It’s been such a delight looking at everyone’s creations each week – including yours! Happy New Year! It’s been such fun baking along with you, Jessica. I agree – the next group will be fun, but I can’t imagine it being the same. 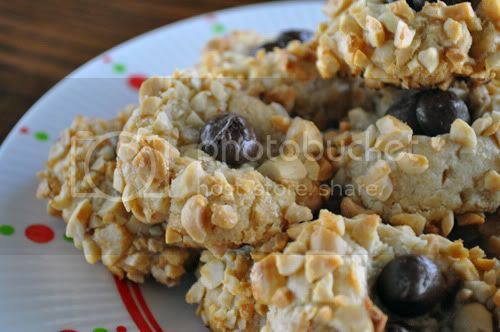 I love your chocolate/PB variation on these cookies – definitely the way I will make them next time! It’s been fun baking with you! Thanks for all your kind TWD comments. Happy Baking in 2012! These look so tasty and easy to make. Thanks!